Giving your kitchen a refresh? Follow this guide to choosing the best paint for cabinets. Q: Our kitchen is ready for a refresh, starting with a new color for the cabinets. What’s the best paint for kitchen cabinets? I need advice on choosing the right primer, color, and finish. A: A fresh coat of paint will not only transform your cabinets, it can give your whole kitchen a clean, fresh look—and it sure will save you money over an entire cabinet replacement. 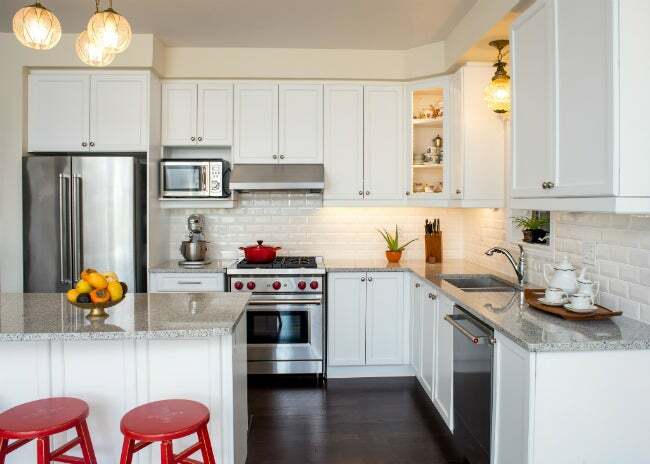 So kudos to you for extending the life of your wood cabinetry by sprucing it up yourself! The guide below will help you pick products for solid wood cabinets, and also work for plywood panel, wood veneer, and MDF cabinets with proper sanding. Choose the best color. You’ll want the new cabinet color to complement your countertops, flooring, and overall color scheme but by no means feel pressured to make everything match—contrast can be interesting. When choosing colors, also consider your climate: If you live somewhere warm and have lots of natural light streaming into the kitchen, you may want to stay away from dark paint, which can act as a magnet for the sun’s heat. Keep in mind, too, that very pale and very dark shades show wear, tear, and cooking splatters more quickly than the wide range of hues in between. As for cabinet interiors, you can skip painting them altogether if you line them with contact paper—an inexpensive, attractive option that can protect and extend the life of your shelving. Prime before you paint. Priming will keep discoloration, splotches, and visible knots in the wood at bay. Primers fall into two main categories—light and dark—so generally speaking, you’ll choose your primer based on your paint color. 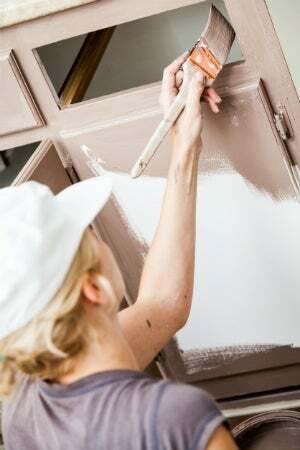 If redoing your cabinets in white, cream, or a pastel shade, use a primer suitable for light paint, and if going with a dark color, get a primer that won’t peek through. Most manufacturers clearly state each primer’s paint color suitability on the label, so it should be easy to find what you need. Purchase enough primer for two coats to go over finished cabinets (or, less likely, just one coat for raw wood or matte-painted cabinets). Address the oil versus latex debate. The two primary differences between oil-based paint and latex-based paint on kitchen cabinets are final texture and dry time. Oil-based is more traditional and popular with purists who like the “painterly” look of brush marks, while latex gives a more consistent finish. But oil-based paint can take up to a full day to dry, as opposed to a couple of hours for latex. Plus, if you choose a low- or no-VOC latex paint, the odor will be considerably less offensive as it cures. Go for the gloss. With all that opening, closing, cleaning, and other handling, kitchen cabinets endure a good deal more wear and tear than other surfaces—something to keep in mind when choosing a paint finish. Higher-gloss finishes stand up better to daily use and are far easier to clean without dulling the color over time. So skip matte, satin, and eggshell finishes in favor of semi gloss or high gloss. If you choose to paint the interiors, use an eggshell finish, which stands up well to the weight of heavy dishes. Glossier finishes, while ideal for cabinet exteriors, can dent slightly when used on shelves and even stick to the bottom of your dinnerware. Once you’ve chosen your primer and paint and picked up a few accessories like paint trays, drop cloths, an angled sash brush (great for cabinet grooves), and perhaps a small roller to ease your way across broad, flat surfaces, check out this tutorial on how to paint kitchen cabinets and you’ll be on your way to a brighter, fresher kitchen in the span of a single weekend.